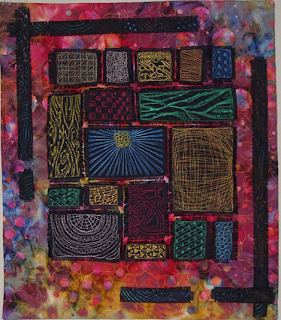 When Worlds Collide, 18" x 36"
Finding My Way, 65" x 65"
In addition to my "VisitHattiesburg" piece winning the $250 purchase award in the Miss Hattie's hat challenge, "When Worlds Collide" was awarded the Thread Artistry $300 gift certificate sponsored by Superior Threads. 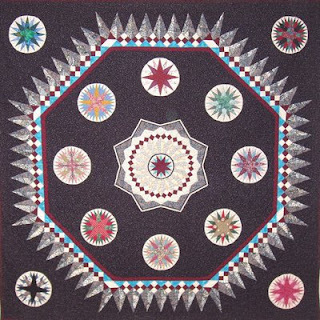 "Finding My Way," the expanded mariner's compass quilt mentioned earlier in my blog, won first place in the pieced wall quilt category (prize was 8" Gingher shears). Three other pieces won ribbons--Pyrotechnics (pictured below), Fire, and Earth. Wow! 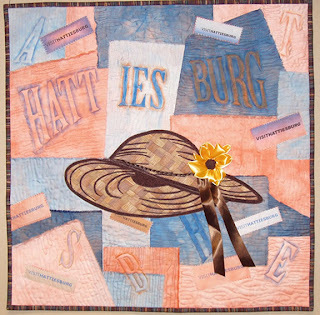 What an honor to win the challenge and have my quilt win the $250 purchase award by Hattiesburg Convention and Visitors Bureau. There were 18 hat quilts submitted, and each 24" x 24" piece was an outstanding display of ingenuity and creativity. There were feathers, ribbons, bows, veils, fur, and flowers. 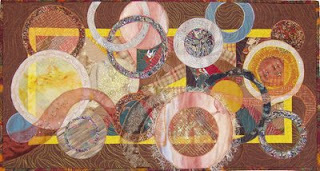 All the pieces will be displayed in the Saenger Theatre in downtown Hattiesburg after the Pine Belt Quilters show is over this weekend. My piece, entitled "VisitHattiesburg" will remain the property of the bureau to be used in the visitors center. We received about 475 quilts to hang for the show; Flavin Glover began the judging process today on small categories as we were hanging the larger ones--61 in the team-large-pieced, and 44 in the theme (two-color quilts) category. Lake Terrace will be quite a sight when the show opens Friday.